A few weeks into my son John’s first semester at college, a friend asked him to sign a Meatless Monday pledge. He figured one day a week without meat wouldn’t be too hard, so he put pen to paper. Several weeks in, I asked him how it was going. With no hesitation, he said it was really hard. Some Mondays he simply forgot. When he remembered, the smell of bacon tempted him at breakfast and crisp turkey paninis called his name at lunch. By dinnertime, he’d walk into the dining hall, ravenous after a long sports practice, and see juicy burgers, curried chicken, or glazed salmon. Food choices at colleges these days are rather impressive—and a buffet line puts the many temptations front and center! When he came home for Christmas break, I figured I’d help him get back on track. If we all went meatless together, the challenge would be infinitely easier, right? The first Monday, I completely forgot. So I made up for it on Wednesday of the same week, deciding we would still be true to the spirit of giving up meat one day a week, even if the alliteration was lacking. A reader named Mary Lou first shared a version of the following recipe with me over five years ago. Mary Lou has faithfully prepared my recipes since the early days of my blog, regularly commenting and providing thoughtful feedback. She thought I might enjoy the flavor and ease of this filling soup as much as she did—and she was right. When I made it most recently, I was prepared for a groan or two from a family member who is decidedly not a fan of lentils or sweet potatoes. I served the soup without comment (hoping a side of cornbread would boost his spirits), and was completely shocked when everyone around the table raved. I think one teenage boy actually uttered the words “This is awesome! Maybe the soup tasted especially good on a cold day, and perhaps somebody mistook the sweet potatoes for carrots. Regardless, I was delighted that a soup I’ve always enjoyed was suddenly a hit with all. It was also a reminder that being vague about what’s on the menu can be helpful when feeding “selective” diners. When asked what was for dinner, I simply called it a hearty soup that one of my readers shared with me many years ago. This way, nobody took the first bite with his mind already made up. 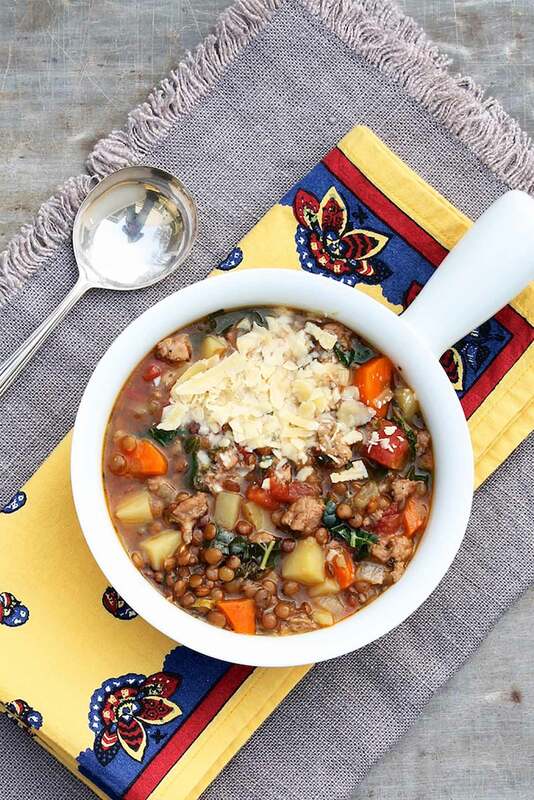 Instead, a handful of well-chosen seasonings create a flavorful broth, making the hearty (dare I say meaty) lentils and filling potatoes inviting to even the most enthusiastic of meat eaters. The aroma wafting from your kitchen while this savory soup cooks is delightful. Leftovers improve with age, although they will become more stew-like as the lentils continue to absorb liquid over time. If desired, simply thin with additional broth. 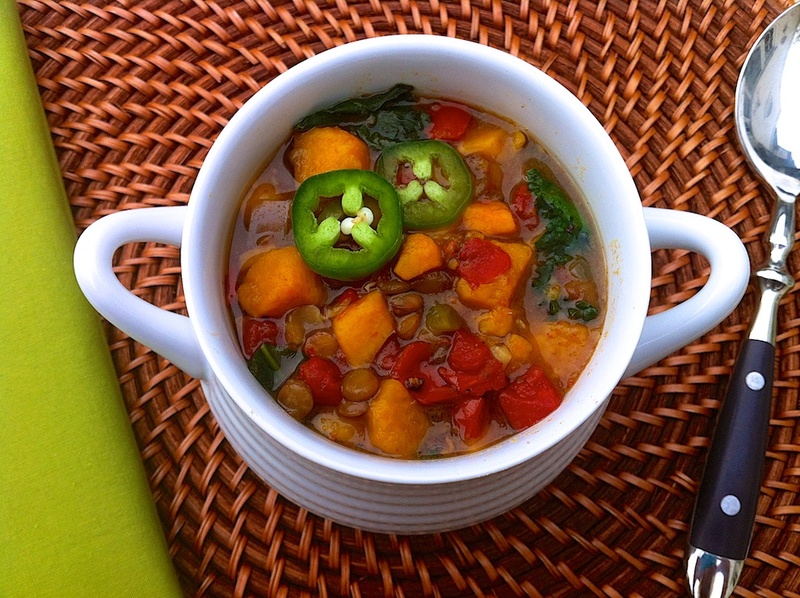 In a 4 – 5 quart slow cooker, combine the sweet potatoes, lentils, onion, jalapeño, and garlic. Add the broth, tomatoes with juices, curry, and ginger. Add the kale or spinach, honey, salt and pepper during the last 15-30 minutes of cooking. Check for seasoning (you may wish to add another pinch or two of salt depending on the type of broth used—or perhaps a full teaspoon if using unsalted stock) and garnish with yogurt or sour cream, chili peppers and/or crushed red pepper if desired. *My husband claims to not love ginger, but I level off the tablespoon and the resulting flavor is subtle enough that he enjoys the soup without realizing there’s ginger in it. **This amount of honey will not make the soup sweet, but it does balance the flavor nicely. You can use maple syrup or brown sugar for a vegan option, or omit if preferred. Wow! You are welcome and so happy you liked the recipe Ann! Isn’t the aroma delightful? I need to thaw some of the grass fed ground beef I have in freezer to make the lentil soup recipe you have on here. I almost sent you a message and then I thought it would be a fun surprise! This is truly a keeper and I am thrilled you sent the recipe my way. Thank you, Mary Lou! I thought you would be excited to hear, Mary Lou, that The Huffington Post asked to use one of my slow cooker recipes and I suggested this one! If you’d like to see this and some of the others, here is the link. It is number 36 out of 43. This recipe has truly been a hit! in this recipe you say 4 cloves, do you mean 4 toes, or 4 whole cloves? Good question, Roberta! I used 4 cloves from one head of garlic. I haven’t heard the term “toes” before…good to know! We call the whole thing a head of garlic and the individual pieces the cloves. You are going to love it, Winnie! I was just telling my husband that I could eat it every night. Will be making more here soon! I am making this weekend, we are going to our cabin for the weekend and having some friends down. I know this will be a huge hit! A weekend at the cabin sounds wonderful! Enjoy the getaway…and the soup! 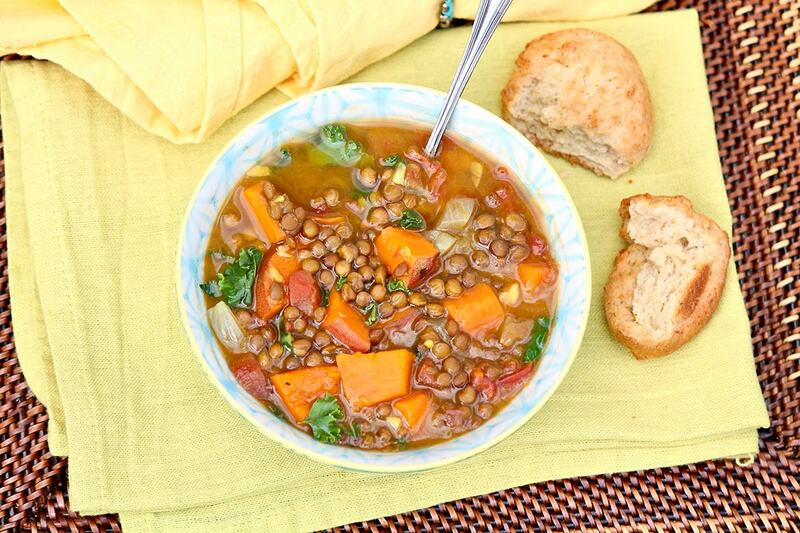 I love lentils and I love curry but have never put the two together, this soup sounds wonderful! And it’s so fun that it can be done in the slow cooker. How great to come home to this after a day of working (or playing)! 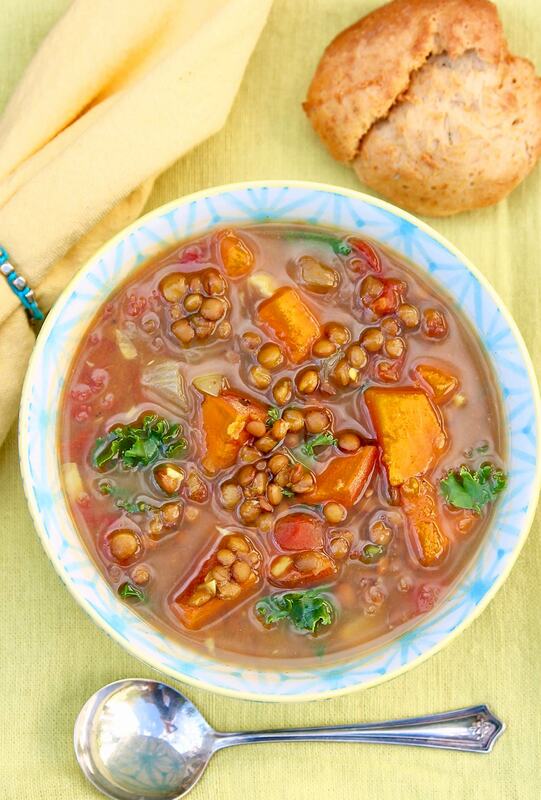 This soup smells as delicious as it tastes, thanks partly to the curry which works so well with the lentils. This recipe is definitely a treat to come home to! Thank you for the thoughtful comment! Ann, wow! how exciting for the recipe to be on Huffington Post! We had it for dinner on Tuesday and it was wonderful to come home to that aroma after working a very long day! I thought you would be so happy to know this, Mary Lou! I do love that aroma! Looks SO good! 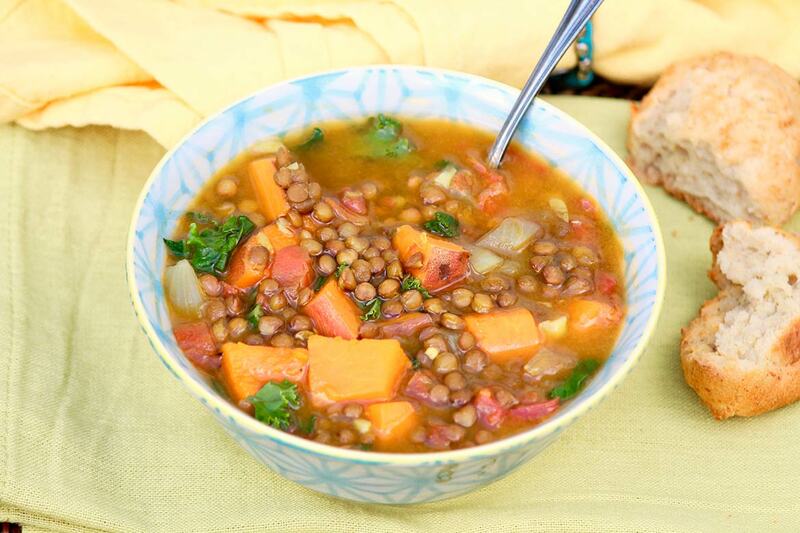 Have your tried green or red lentils? I’ve heard red cook differently so wanted to see your thoughts. Thanks! It smells as good as it tastes, Belinda! I would not use red lentils (which are often split) or yellow lentils as they will become mushy. Green or French lentils should work just fine. If you try, I hope you enjoy! Thanks for your response! I only have 1 tsp of curry on hand. Would that even make a dent with flavor or would you go for the full TBSP? I was going to run to the store to get more but would have to add it a few hours into cooking. Worth it or not? Also does this tend to be pretty spicy? Feeding it to kids and adults. Thanks again! I would go ahead and make it even if you are low on the curry. I think you will still get a hint of the flavor and be happy with the outcome. If you are concerned about the palates of the kids who will be eating, you might want use the lesser end of the ginger mentioned. My kids enjoy the soup with the full tablespoon but, since ginger is somewhat pungent, you could err on the side of caution. I hope everyone enjoys! (Time sensitive) Ok so I made a big mistake. Used green split peas and it’s already all mixed. I could take them out still and go grab some green lentils. Thoughts? Oh goodness…of course this has to be the day I am in meetings! The split peas will cook in far less time but could end up tasting delicious in this soup. Please let me know how you made out! Would frozen kale or spinach work instead of fresh? I think it would be a great option, Erika–convenient, too. Just add it towards the end of the cooking time. That should be no problem. Coincidentally, I just made a chili recipe with lentils on the stovetop and simmered it for 30-35 minutes. Like you said, though, just check for the lentils to be tender. Hope you enjoy! Hi there! I am curious about the yield, or quantity/size of servings. Entering recipe into LoseIt and don’t quite know what to tell it. Thanks so much! I would plan on eight servings from this recipe. Hope you enjoy! THANKS! I am getting ready to make it now. Very excited! Awesome! I’d love to know what you think! I made this using a pressure cooker because I live at high elevation and it was awesome. Great taste and impressed my husband. Thank you! You are welcome, Elena, and thank you for the terrific feedback! I’m hopeful it turns out. Fingers crossed!!! I can’t wait to hear. I bet it’ll be fantastic! This one looks really delicious on a cold snowy day like today. I will try it tomorrow instead of the usual football Sunday chili. Thank you! My pleasure! So glad you’re giving it a go and hope you enjoy it as much as we do! I’m thrilled you made this and liked, Sue! This sounds delicious! 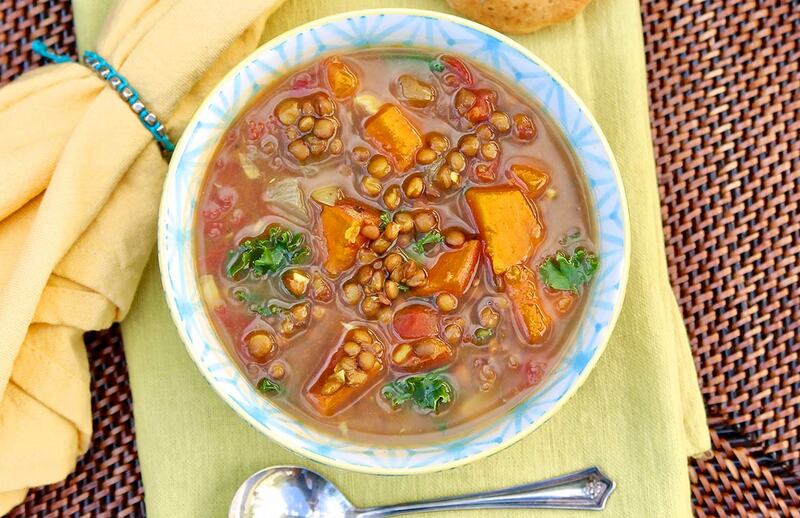 Can you substitute red or black lentils? Red would change the consistency as they break down over time, so although the taste would likely be very good, know that the texture would be different. Black lentils would hold up much like brown (or even green) lentils, so I’d try them first. (But you might hit on something delicious with red, too. 🙂 ) Hope that helps! Silly question, but….I’d love to make this soup but I don’t use a slow cooker. How do I alter the recipe to simply make it “the old-fashioned, put it in a pot” way? Your question is a good one. Out of habit I always make this in the slow cooker, but it should work quite well on the stove top. I’d start by softening the onion in a tablespoon or two of olive oil. Then add the garlic, ginger, and curry powder (adding a drizzle of oil if the pot seems dry) and saute until fragrant, about 30-60 seconds. At this point you can add everything else to the pot with the exception of the greens, honey, salt and pepper. Simmer on low, covered, until the lentils and potatoes are tender but not mushy. Start checking for doneness around the 30 minute point. I’m estimating it will take about 40 minutes but will vary depending on precise level of heat, age of lentils, etc. You can add the greens, honey, and salt and pepper during the last few minutes. The greens will soften quickly. You might also want to keep an extra cup or so of broth on hand, adding it if needed towards the end, as slow cooker recipes usually require just a bit less. If you try, please let me know how this works for you. I hope you enjoy! I made the soup last week, Ann, and it’s yummy, indeed! It was so nice to have leftovers and the flavor just improved every day, too. And all went well doing it in the good old-fashioned pot! Thank you for the follow up. So glad that you enjoyed and were successful without a slow cooker! Made this for dinner last night and we loved it! Thx for another great recipe! Great news! Thanks for letting me know, Nancy.